Pirate is Clive Cussler’s latest, a Sam and Remi Fargo adventure, co-authored by Robin Burcell. As Cussler fans know, Mr. Cussler is lead writer of many of his books, Cusslerizing the writing of others well know for works of their own. Grant Blackwood, Russell Blake, Robin Burcell, and Thomas Perry have all co-authored one or more of the Fargo’s adventures. Pirate is a treasure hunting tale featuring the Fargos, a wealthy husband and wife team with a knack for research and the discovery of long lost treasures. Funds are never a problem for the globetrotting Fargos. Back at the ranch in La Jolla, they employ a research team with access to fabulous resources, with Selma Wondrash as the lead researcher, booker of travel arraignments and general go-to person who lubes the way for the Fargo’s success. Fargo adventures share a sense of light banter and by-play between the Fargos that makes the stories a bit softer than other Cussler series books. The tale opens with a version of the story of the loss of King John’s treasure, a vast fortune in valuables, coins and crown jewels. This sets the stage for the hunt. We meet the Fargos in San Francisco’s China Town where they are searching for a copy of Pyrates and Privateers at Pickering’s Used and Rare Books. Immediately, they are confronted by a minion of Charles Avery, a corporate raider, salvage expert and all-around bad guy who also is searching for King Johns treasure. As is typical in the Fargo adventures, Sam and Remi bounce from one spot on the globe to another running down clues at the sharp end of the stick, feeding Selma info she synthesizes into practical next steps. In Pirate, they hit Jamaica, Oak Island off of Halifax, Snake Island off Brazil, and Great Britain in their search for King John’s treasure. The Fargos find themselves one step behind Charles Avery most of the time. The exciting conclusion occurs underground (as is often the case in Clive Cussler’s stories), this time in caves under the city of London. There they fight a final battle with the evil Charles Avery and his troops and of course, find the treasure. Another in the long series (17 to be precise) of Clive Cussler’s New York Times best sellers, this is an action packed adventure studded with bits of history, geography and light romance between the Fargos. Did I want to keep reading? Yes! And ye, Antiquarians, Archaelogists [sic], Ethnographers, Ethnologists, et hoc genus omne, hold back in their leashes your quivering Fountain-pens! For this is no learned Treatise, but a simple Book, and written thus. A vintage hardcover of The Pipe Book: The Classic Volume on Pipes and Pipe Smoking by Alfred Dunhill is now in stock. Printed in Great Britain, copyright 1924, 1969, this version says it’s a complete revision with many new photographs. Indeed, almost every page is complete with illustrations and black-and-white photos of pipes throughout history. Tobacco, pipe, and the smoker are leisurely surveyed throughout the ages in this captivating book. Alfred Dunhill ranges through anthropology, the migration of peoples, cultural history, and folklore with so much wry humor and entertaining anecdote that he will intrigue not only the pipe lover, but anyone interested in the idiosyncracies [sic] of man. Mr. Ambrose leads with facts, colors in with stories and ends with stats. You know how many spikes, ties, snake plates, rails and carloads of ballast build a mile of track. You learn if Jeff Davis had not lead the house and senate members of the soon to be Confederacy out of the capitol when Lincoln was elected president, the bill to locate our first intercontinental rail line north of the Mason/Dixon line would not have passed. Of course you know the CP started West from Omaha (the rail bridge over the mighty Mo came 2 years after the tracks joined in Utah), and the UP started East from Sacramento. The UP has to blast their way through Sierra Nevada granite. Supported by skilled Chinese labor who knew a thing or two about black powder blasting, the UP overcame one engineering obstacle after another. The financial arrangements were egregiously crooked, making a few men wealthy and triggering senate investigations. The line was built as fast as humanly possible: if the choice was between completing miles of finished track and any other consideration, fast always won. The term “Hell on Wheels” referred to a traveling tent city set up at the rail-head, supplying booze, broads and bacon to workmen. The whole plan proceeded due to the US government’s ownership of the vast majority of land west of the MO. That meant US could grant the entrepreneurs (who risked capitol to pay for grading and track) land. Alternating sections of land to the right and to the left of the track right of way was the prize that spurred on this project. A tapestry of larger than life personalities (railroad, money men and politicians) is woven over the historic frames of reference. 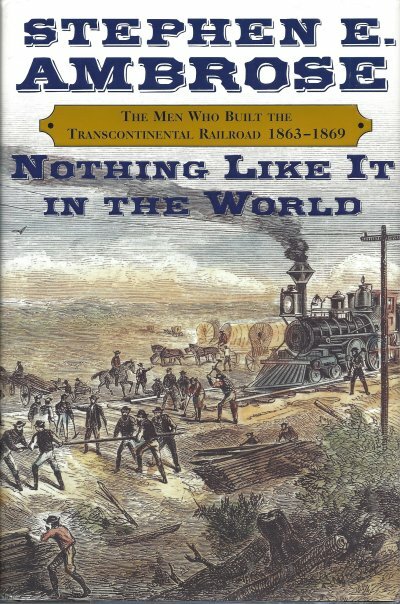 Civil war finishes, so a flood of available men used to taking orders, Noble had just patented nitroglycerin, Lincoln, avidly pro railroad, assassinated but not before he signs the bill, Native Americans pushed from subsistence living, steam locomotive and telegraph technology, all came together with American Exceptualism, aspiring to build a transcontinental railroad across trackless wilderness and three mountain ranges. No question, the book passed my acid test. Did I want to keep on reading? You bet. A collectible hardcover edition of From So Simple A Beginning: The Four Great Books of Charles Darwin, introduction by Edward O. Wilson, is now in stock. It comes in a nice slipcase and is in beautiful condition! Our price is $18.50. Find it in our science section or shop it online! 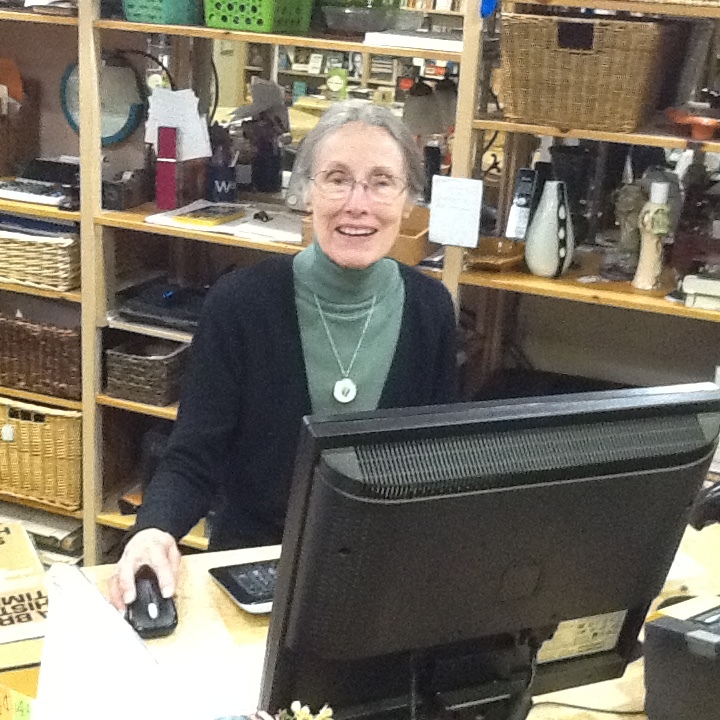 After we have chosen the books we want to buy, each book is entered into our computer and on-line inventories. We also scan a picture, for on-line shopping, of books that don’t already have a stock picture. Then the books are moved to the cleaning table. 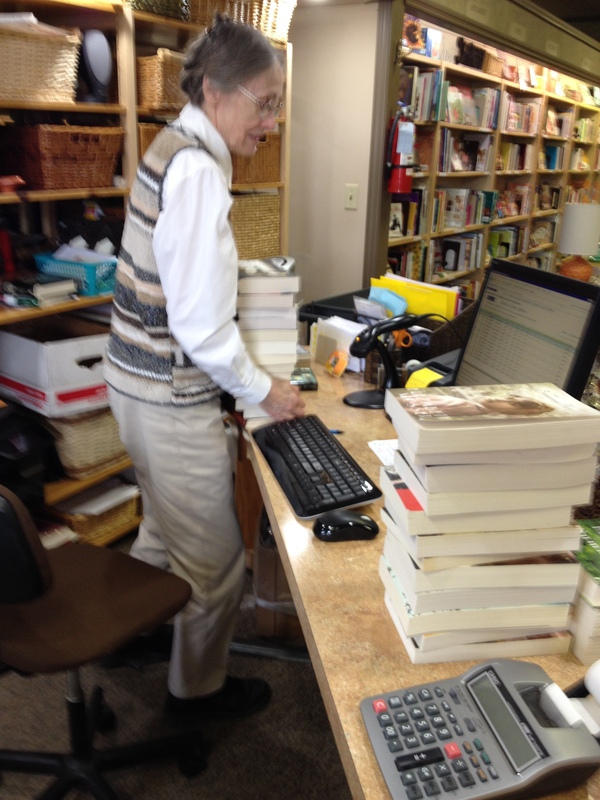 Here is Katherine Ann entering books into inventory, and moving books from the “to be entered” stack over to the “to be cleaned” table. In Clive Cussler’s latest, the wealthy husband and wife treasure hunting team Sam and Remi Fargo are at it again, this time in Guadalcanal. Are gold and jewels to be found in a sunken city, or in jungle caverns haunted by a race of legendary giants? Why have the islands children been disappearing and what of the chaos as ambitious islanders vie for control of the economy. A key character in these novels is researcher Selma, who, back at the ranch, pulls crucial data from her many resources just in the nick of time for Sam and Remi to put it to use. Sam and Remi seem to forget that every time they enter a: cave, underground river, temple, ruin, or portal of any kind it invariably collapses behind them, forcing them to squeeze through tiny passages whilst holding their breath looking for another exit. Typically Cussler, the Fargo series focuses on geography, geology, history, exploration and scuba diving. These are delightful reads and one always learns something new. Did you know the Siouxland Renaissance Festival is going on this weekend? We’d like to heartily welcome any festival-goers to stop by and visit us here at Book Shop & Gifty Things Vintage! Find out more about attending the Siouxland Renaissance Festival here. Several copies of the perennially popular The Children’s Blizzard by David Laskin are currently available. We keep this book in our South Dakota section…when it’s actually in stock long enough to put away! Thousands of impoverished Northern European immigrants were promised that the prairie offered “land, freedom, and hope.” The disastrous blizzard of 1888 revealed that their free homestead was not a paradise but a hard, unforgiving place governed by natural forces they neither understood nor controlled, and America’s heartland would never be the same. Our price is $6.95 in paperback, $8.75 in hardcover – find it in-store or in our online shop. A new addition in our nonfiction world history section this week is Spice: The History of a Temptation by Jack Turner. A brilliant, original history of the spice trade–and the appetites that fueled it. It was in search of the fabled Spice Islands and their cloves that Magellan charted the first circumnavigation of the globe. Vasco da Gama sailed the dangerous waters around Africa to India on a quest for Christians–and spices. Columbus sought gold and pepper but found the New World. By the time these fifteenth- and sixteenth-century explorers set sail, the aromas of these savory, seductive seeds and powders had tempted the palates and imaginations of Europe for centuries. Our price is $8.50 – find it in-store or online. Books on both George Washington and Martha Washington have arrived today.